Servindi, September 27, 2017. 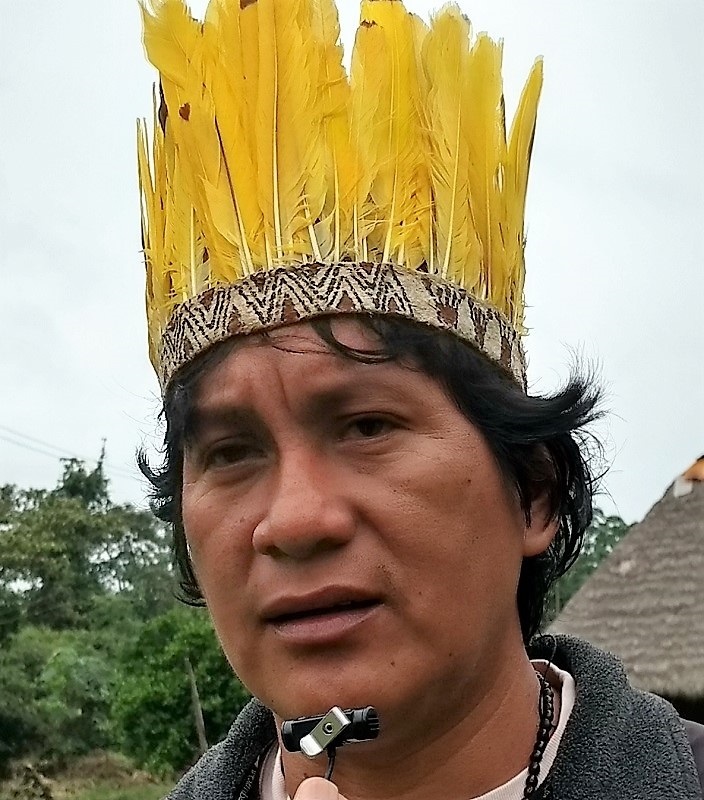 - The Amarakaeri Communal Reserve (RCA), an area of Amazon forest with more than 402,335 hectares, will continue to be protected by the indigenous communities of Madre Dios thanks to its active participation in the co-management with the Peruvian State of said protected natural area. With this commitment, the IV Congress of the Contract of Administration Executor (ECA, in Spanish) ended. The Contract of Administration Executor is an administrative body of social base, which promotes projects of sustainable development in the communities based on the territorial management and the full life of the communities. The representatives of ten indigenous communities that protect the communal reserve participate directly in the ECA. 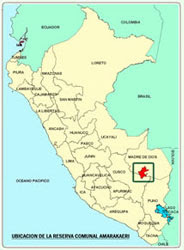 The communities are: Queros Wachiperi, Shintuya, Shipetiari, Diamante, Puerto Azul, Boca Isiriwe, Masenawa, San Jose de Karene, Puerto Luz and Barranco Chico. The communities are affiliated to the Harakmbut, Yine and Machiguenga Counsil (COHARYIMA), whose leaders participated in the event, as well as the representatives from the Native Federation of the Madre de Dios River and Tributaries (FENAMAD), which brings together all the communities in the region. 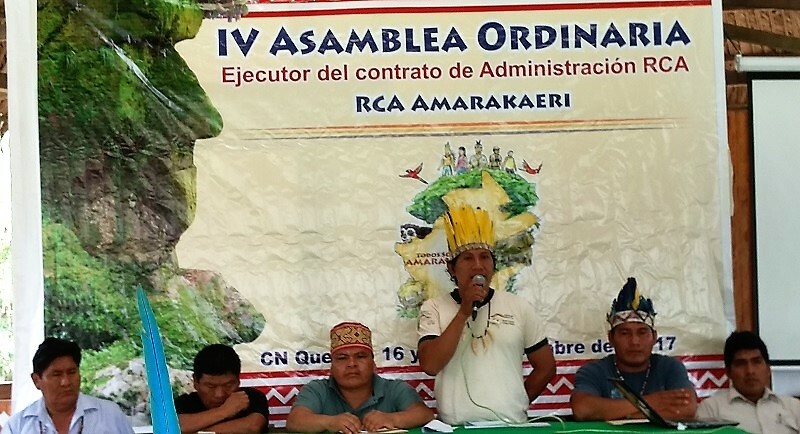 The ECA-RCA assembly was held on Septemeber 16 and 17, in the native community of Queros, of the Wachiperi ethnic group, located in the district of Kosñipata, in the province of Paucartambo, in the Cusco region. The event unanimously approved the two-term management chaired by Fermín Chimatani Tayori, who leaves the ECA-RCA presidency, considered a model of co-management for the communal reserves of Peru. Fermín Chimatani now has the challenge of applying his knowledge in the Asociación Nacional de Ejecutores de Contrato de Administración del Perú - ANECAP (National Association of Executives of the Peruvian Administration Contract), whose leadership he recently took over. 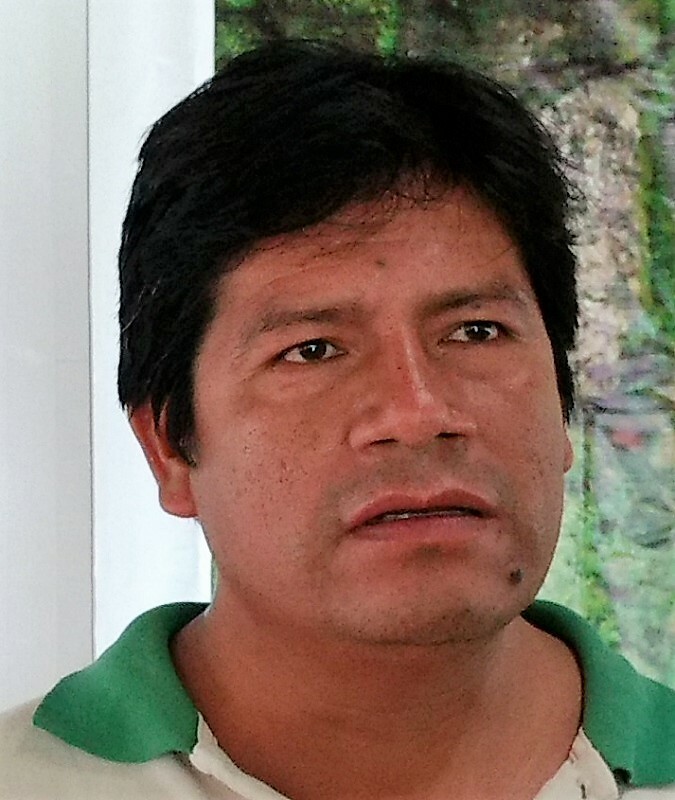 The event elected Walter Quertehuari Dariquebe, of the Harakbut Wachiperi people, as president of ECA-RCA. It should be noted that Walter, served as vice president in previous administration and has the experience and ability to continue the guidelines from the Fermín Chimatani administration. 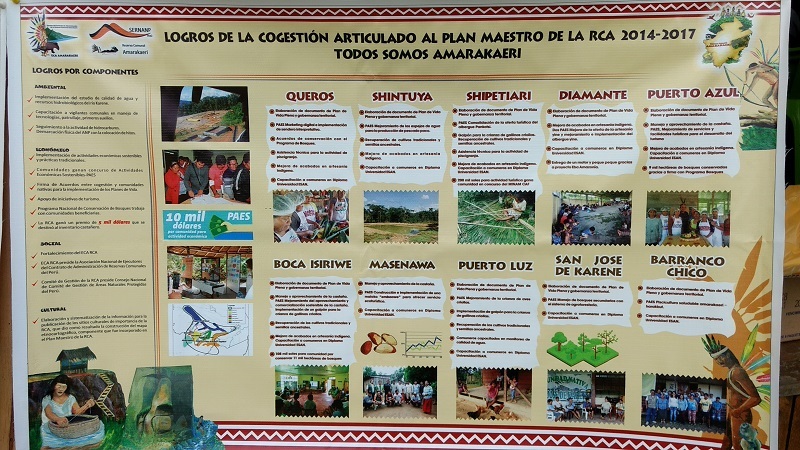 During his management in the ECA-RCA, Fermín Chimatani Tayori explained in detail the achievements which led to ECA Amarakaeri being appreciated as a management model at national and international level. He was recently selected to chair ANECAP. 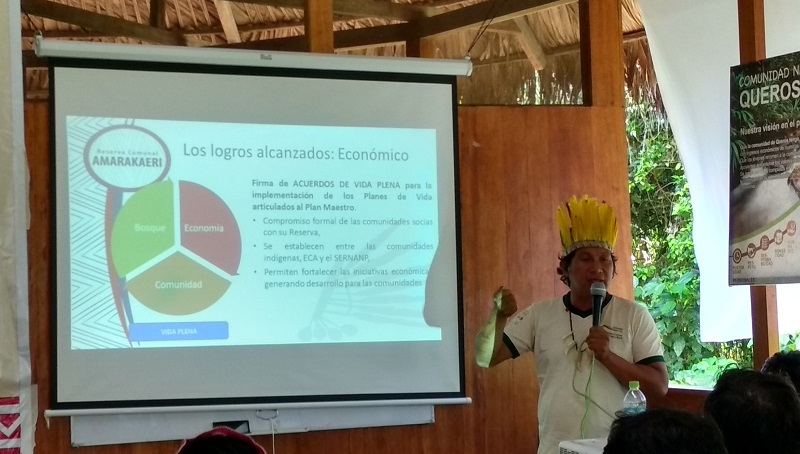 In addition, the Amazonian Indigenous Redd (RIA) Amarakaeri model is being used as an inspiration to be applied to nine communal reserves and other indigenous territorial bases of the Inter-Ethnic Association for the Development of the Peruvian Amazon (AIDESEP). The presentation of Fermín Chimatani’s management developed in detail the actions carried out in four main areas: Environmental, Economic, Social and Cultural. They also detailed the achievements and works carried out with each of the ten communities, highlighting the elaboration of Plans of Full Life, aligned to the Master Plan of the Amarakaeri Communal Reserve. The progress in the implementation of the Programa de Actividades Sostenibles - PAES (Sustainable Activities Program) was also presented. This program finances a community-oriented idea of environmentally friendly businesses and the assistance and guidance for the development of tourism activity within the framework of the Eba Amazonía Project , sponsored by the United Nations Development Program (UNDP). Chimatani's presentation also showed the difficulties and problems that arose during the administration and how they were answered and resolved. He completed his presentation explaining the opportunities offered by the pending agenda and proposed the importance of implementing a communication system. The two - day event was the perfect time to inform and move forward in the process of the Harakbut Nation’s government formation, which took place throughout the afternoon of Sunday 17. The day ended with the election of a committee that will coordinate the process composed of four leaders: Antonio Iviche, Luis Masahuari, Miguel Visse and Janet Corisepa. They are all recognized and respected leaders of the Harakbut people. The presence of Antonio Iviche Quique stood out. He is an experienced leader who not only presided over the first ECA-RCA, but also presided over AIDESEP. 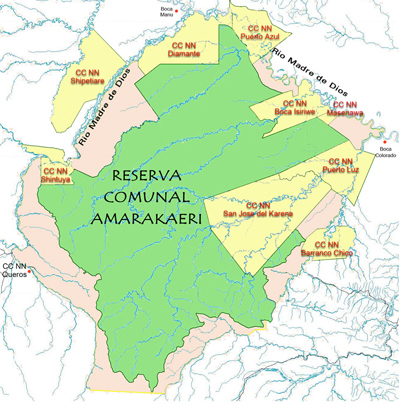 The Amarakaeri Communal Reserve is located in the districts of Fitzcarrald, Manú, Madre de Dios and Huepetuhe, province of Manú, department of Madre de Dios. It was created on May 9, 2002, by Supreme Decree 031-2002-AG. It has an area of 402 335.62 hectares. Busca It seeks to contribute to the protection of the Madre de Dios and Colorado river basins, in order to ensure the stability of lands and forests to maintain water quality and quantity, ecological balance and an adequate environment for the native communities’ development.